The King of the Weekly $10K? The field in the Encore $10K Guarantee I won a couple weeks back wasn’t the largest since it went to a weekly schedule at the beginning of October (there have been six events so far, with one week replaced by the Anniversary $25K Guarantee) and it had the fourth-largest pot, but with all the chops going on, my first-place $4,275 prize is the largest single prize awarded in the weekly game so far. My Monday night home tournament got cancelled, so I took the opportunity to spend the evening at Encore, excited for a chance to finally play the PLO game at 7pm. I had some time to wait, though, and I thought I’d be dropping into the 4pm guarantee close to the end of the first level only to find out that I was just the second person to sign up. Within a few more minutes, some more players had been corralled and we got underway, with the guy on my right announcing that his plan was to take everyone out before the break. I apparently was doing my level best to help him out, because I busted and during the second level (although not to him). With another two hours to go before the PLO game, I rebought. That got me to the break—barely—but even with the add-on I was out by 6pm. I went around the corner to get some Thai food. 90 minutes. -100% ROI. 10th of 11 players. There’s something about the volatility of a four-card hand that is incredibly attractive to me about PLO but which seems to being out the crazy in some other players. I don’t think they play any crazier than I do, but they certainly act crazier, and the volume of the club Monday night certainly seemed higher than even the nights when every table is filled for the Main Events. I busted out here when my queen-high straight was beaten by a king-high, then rebought and managed to make it (barely) to the final table. My big regret here was getting shoved another king-high straight to a potential flush, I would have chopped a large pot. Instead, I ended up starting the 1,000/2,000 round after the second break with all of 9,000 chips (in the big blind, no less) or about 3% of the chips on the final table. Amazingly enough, I wasn’t the shortest stack, but I didn’t last long. Two hours and thirty minutes. -100% ROI. 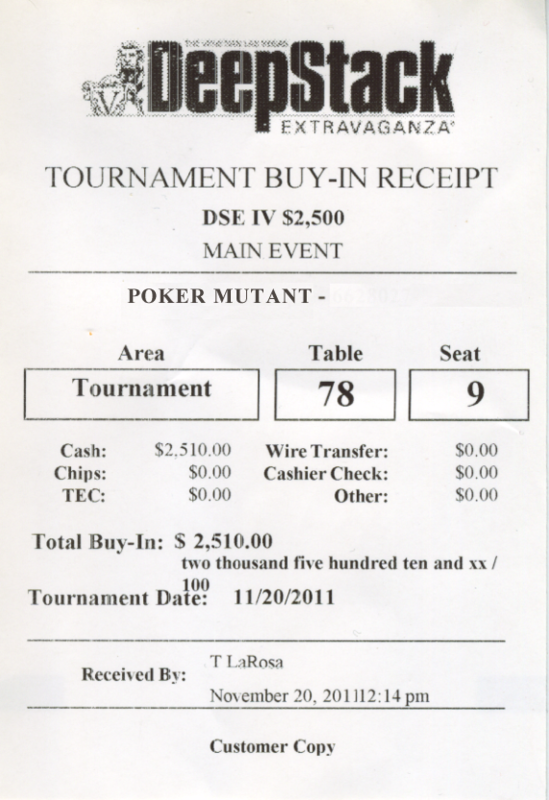 8th of 34 players. I was actually out the door but the night was (relatively) early and I went back inside when I realized the 10pm game was just a few minutes off. Then I noticed a Shootout table in the back that wasn’t full and bought in. Missed opportunities was the name of the game here. I reluctantly tossed a 7♥2♥ from SB pre-flop only to see three hearts roll out on the flop. 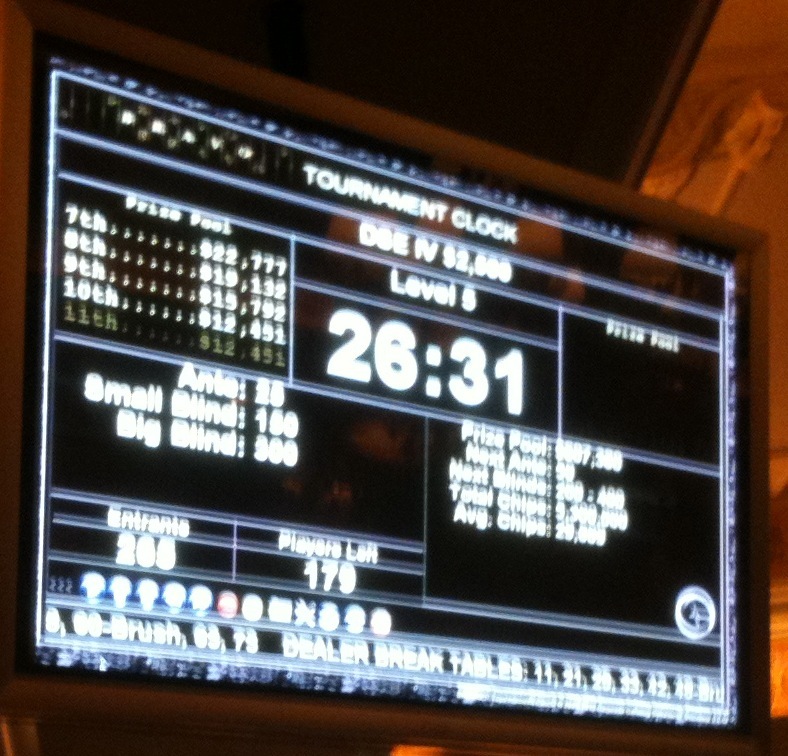 The action was furious between three players, with a pot of at least 40bb built up, and a straight won. 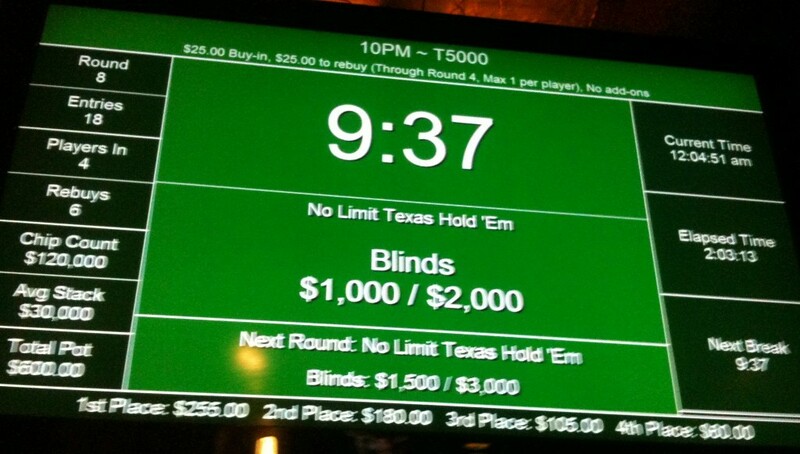 On another hand a Tx8x I considered after a period of card coma would have made a winning full house on the river in a large pot. My stack had been down as far as 23bb at one point but I’d chipped up to about 40bb just before the end of time when I got AxKx and raised. A three-way all-in ensued, with the small stack’s pair of queens improving to a set to take down the main pot. My ace paired, beating the largest stack’s pocket kings, awarding me the 1bb side pot, which I gave to the dealer as a tip. 50 minutes. -97% ROI (not including tip). Broke my rule about not buying in past the first level again (heck, I’d already broken my “no rebuys” rule—twice—earlier in the day). All I remember here is that my better ace was beaten by the ace of spades and four spades on the board for a flush just before the end of rebuy/add-on break. 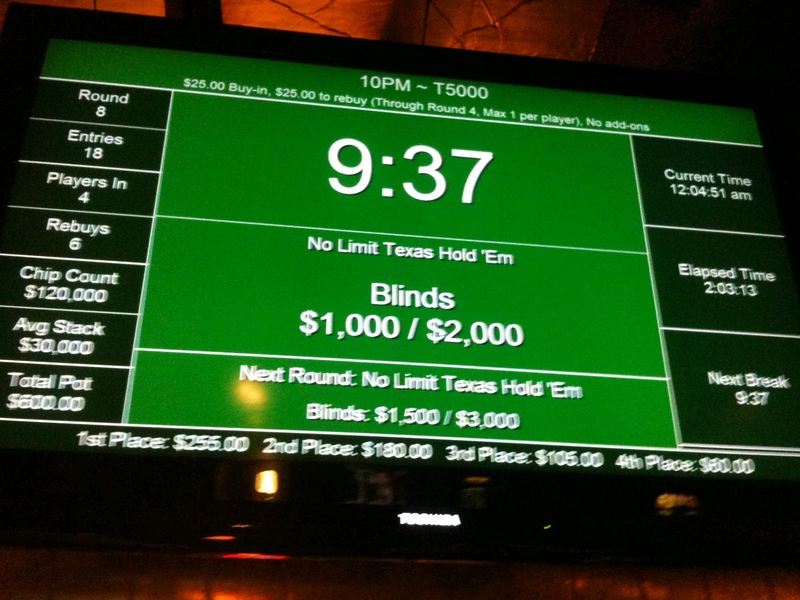 The table tried to rope me into a rebuy but I called it quits for the night. 30 minutes. -100% ROI. 21st of 24 players. Who wouldn’t be stoked to be back for the first running of the game you won the week before? I know I was. I was eager for another win and I think I probably let my excitement run a little away with my play, because I got knocked out before the end of the 50/100 round. The TD said he was stacking the table with previous event winners, but the place I lost most of my chips was to my immediate left in seat 9, where my hands kept getting beat by something slightly better, like double-paired Ax4x v double-paired Ax8x and an ace on the river that killed my pocket pair. 45 minutes. -100% ROI. 76th of 82 players. Rather than wait two hours for the 10pm game to start up at Encore (and after drinking some of manager S’s personal Scotch), I went to lick my wounds elsewhere, breaking a personal rule (again) and getting into the game halfway to the first break. It was a pretty quiet night, and the field was small, but I continued to do something wrong and was out before the break on this one, too. At least I saved myself the add-on for both games. 20 minutes. -100% ROI. 16th of 18 players. I completed my post-Vegas trifecta of the clubs I regularly play with the trip to Aces last night. After my quick bust in the freezeout, I sat and chatted with JB (one of the dealers) and waited for the turbo. There was a fair amount of aggression at our table, with a guy in seat 5 who said he mostly played cash games (I was in 1), a loose player in seat 9 with a tendency to go all-in at the drop of a raise, a decent player on my immediate left and a kid in seat 3 who was playing very tight but strong. It took a while for me to find some equilibrium. I was down to just a couple thousand chips at one point. I called one of the LAG’s all-ins with A♠9♠ and I was ahead of his KxJx with all the low cards on the board, but a deuce on the river put a straight on the board and my potential double-up turned into a chop of the blinds. I kept building but was behind the chip average a lot of the way. 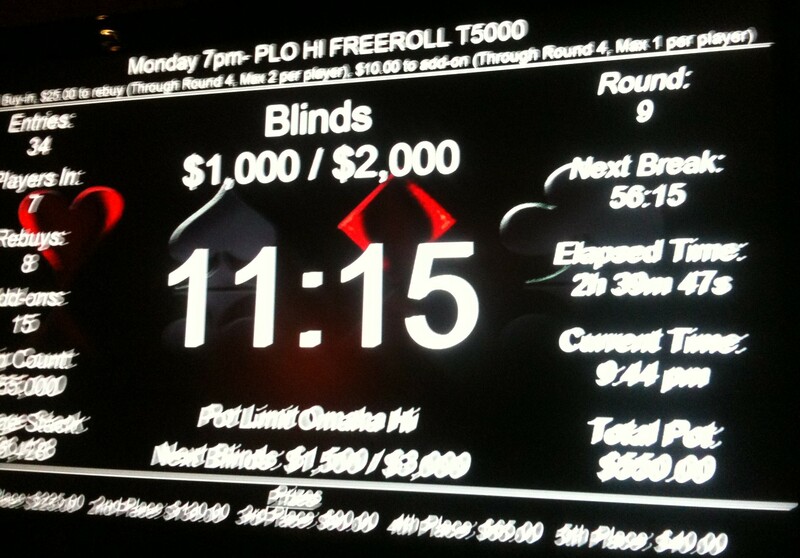 Once we consolidated to the final table, I had to step on the gas to stay ahead of the turbo blinds. I thought I’d be helped by the K♦Kx I got UTG, and raised to 1,600 at 200/400 (about a quarter of my stack) getting several callers. Then the flop hit with 5♦A♦5x and I figured I was screwed. I made a continuation bet and got a single caller who I figured must have an ace. Then another diamond hit on the turn and I pushed. 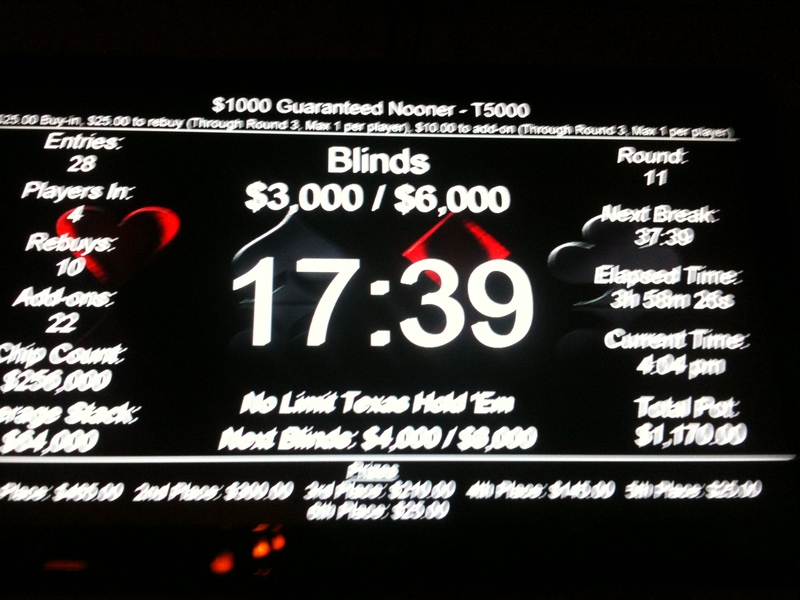 The pot was large, I had the nut flush draw, and we were still five players from the money. That got a fold and I showed the kings, which got a couple of groans from around the table. It chipped my stack up nicely. The LAG guy kept up his all-in raises and there were a couple of times I was tempted to call, but I held off and slowly the field dwindled down to five. There was talk of paying the bubble but the cash player wasn’t familiar with the concept and while everyone else was for it, it never got unanimous assent. I saw a flop with Kx7x from the BB. The cards were 8x6x5x and after a raise from the cash guy—and everyone else folding—I was all-in with my open-ended straight draw. I had about 16,000 chips left (at one point I’d been up to 30,000) and got called. He had top pair and it held through to the river. The dealer congratulated me on my $60 win and I pointed out that I was the bubble, for which he abjectly apologized. It was sort of funny and I didn’t mind. The bubble payment would have just brought my median cash ROI down. Two hours. -100% ROI. 5th of 18 players. I didn’t manage to get to the game until level three had already started, and I was out 700 chips from blinds. Not an auspicious beginning, but nowhere near as bad as when I pulled AxKx v AxAx in the hand of the player on my immediate left. A little later, just short of the break and chance to add-on, AxKx proved to be my downfall again, when he called my all-in push on an un-coordinated king-high board with KxTx. Fifteen minutes. -100% ROI. 22nd of 31 players. 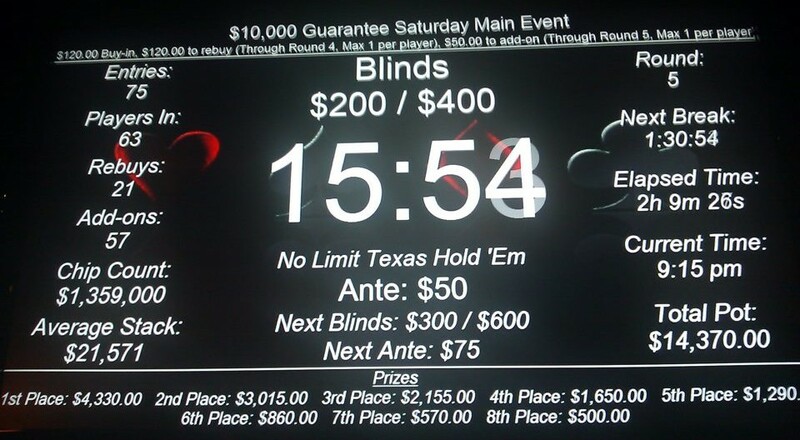 Got into the club in time to qualify for the bonus 500 chip and started off on the black tables because of a leak behind the usual tables due to a torrential rainstorm. Table friendliness was driven by L—a bartender at Boss Hawg’s, “Home of the Hawgarita”—who was buying shots for the anyone who wanted one. Though I typically don’t drink while I’m playing (and probably shouldn’t have here), I accepted and tossed in some of my money from the weekend win. Chipped up nicely when my flush draw beat out a set of deuces and I got the first cocktail just as I was moved to another table. “Another shot!” was the phrase of the day. I managed to stay well ahead of the chip average for quite a while, with over 40,000 chips while we were still at two tables. I lost a little ground calling smaller all-ins with my stack, but managed to push people off a couple of raises as well, including one BB I played with 7♥2♥, going all-in after two hearts hit the flop. L was at the final table and I put in for a couple of drink rounds myself, which may have led to the call I made that kept me from the real money. 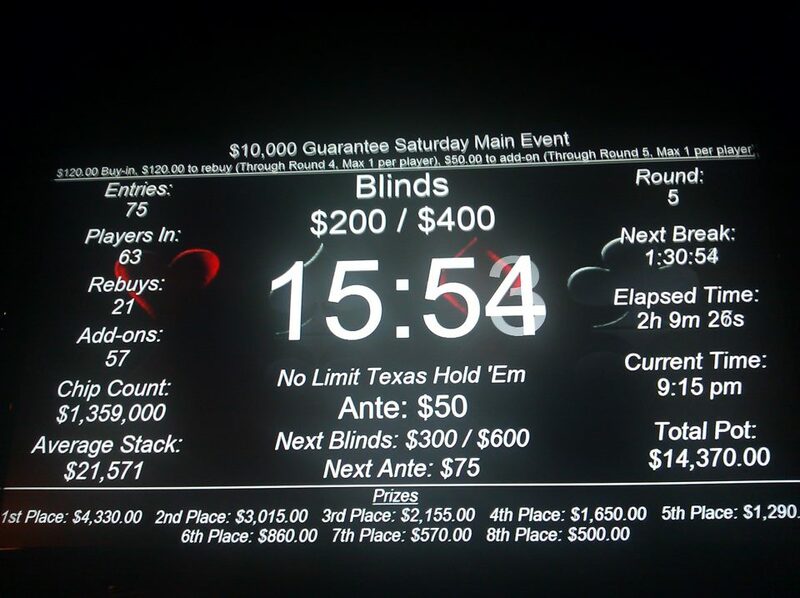 We were at 1,500/3,000 with just five players and I was BTN with K♥9♥ when I raised to 9,000 (a little less than a quarter of my stack) and got re-raised all-in by one of the tighter players from BB. I called him, he showed JxJx and I whiffed the board completely (he caught another jack on flop), which left me with one thin 1,000 chip. The player to my immediate left had been down to 1,500 in the previous level and was up over 40,000, but you did have to wonder if it could happen at the same table twice in a half-hour. 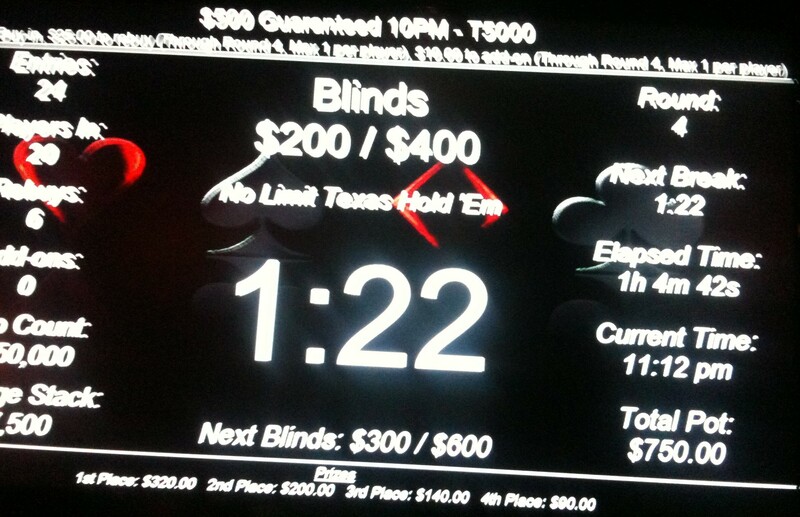 I tossed several hands until I was UTG (which wasn’t long), then tossed my chip in with what I had: Qx4x. Amazingly enough, I quadded up when a queen hit on the turn and I took the main pot, but I was all-in as BB on the next hand and didn’t make it any further. Got deeper than I should have considering I hardly ever drink. Back to whatever passes for diet soda next time, I think. Four hours. 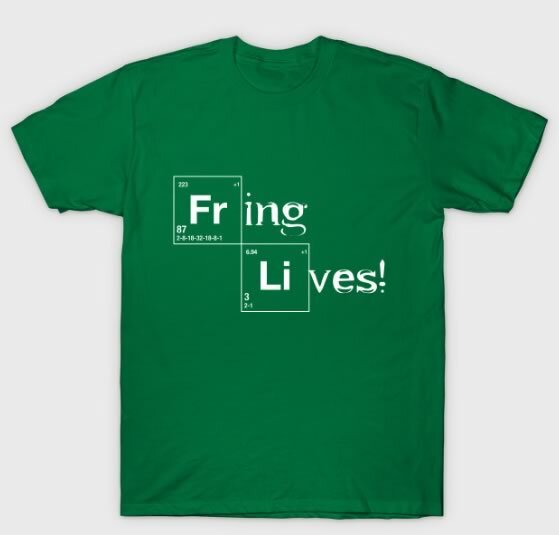 -50% ROI. Fifth of 28 players. Now that my attempt to get to Prague for my birthday is over (unless someone decides to donate $20,000 to the effort in the next few days, which seems unlikely) I’m looking at where to concentrate my efforts. 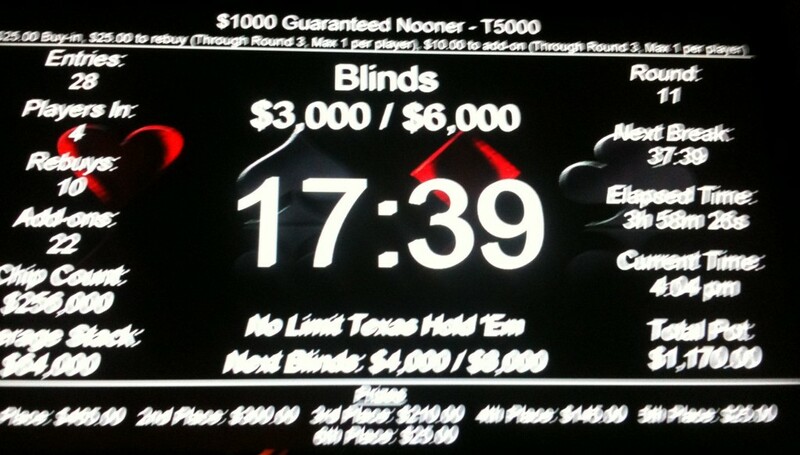 With that in mind, these are some stats from my attempts in $10K guarantee tournaments at the Encore Club. * Monthly event prior to October schedule change. † Weekly event after October schedule change. ‡ Discount from usual monthly door fee for frequent player card. That’s two cashes in five attempts. 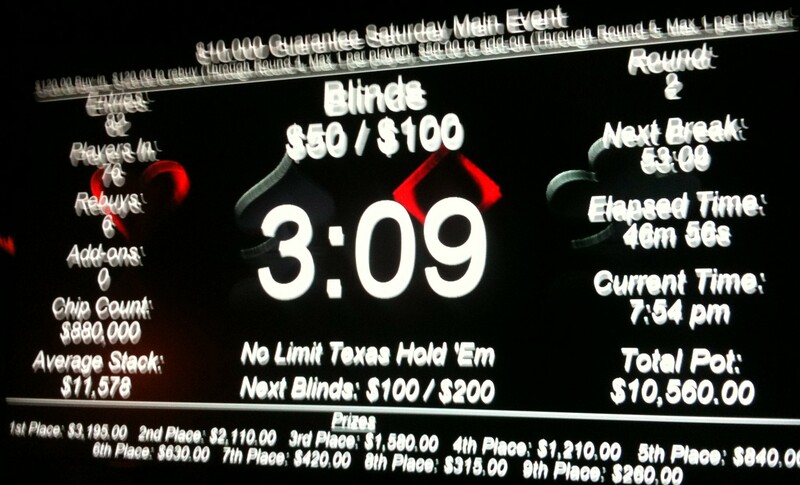 On the other hand, I haven’t managed to cash once in the Aces $10K in 13 tries. Time was running out. If there was any chance of getting to EPT Prague for my 50th birthday, last weekend was pretty much make-or-break time. The second starting day kicks off at noon on December 6 (St. Nicholas’s Day); I’d have to catch a flight on the 4th to get there in time, which meant having the money and arrangements made the week after Thanksgiving at the latest. To do that, I needed to to get to an event (or series) with a potential prize large enough to cover the €5,300 ($7,125) entry fee and expenses for a nice little Yuletide vacation for Ms. Poker Mutant and myself (which only got higher as the date got closer). Not that I hadn’t been trying before. I suppose I should have kept notes on what turned out to be the biggest win of my poker career so far, but I’m back in the mode of not being obsessive about it (plus my iPhone was low on charge). And after the whirl of the past couple of days, I’m not sure how much or how accurate my recollections of the event are. I started off the night at red table 2 in seat 7; we were ten-handed, as usual in Encore’s $10K games (the same table was used for the final). My stack made its usual ups and downs, the first thing I can remember of any significance was when I’d managed to chip up to about 35,000 and a player in seat 1 pushed all-in from BB for the third or fourth time after raises in front of her. I stood to lose about a quarter of my stack calling her with K♥6♥ and she flipped over 9x9x, but got knocked out. The older guy to my immediate left reacted with indignity with the usual cant about how it was a stupid call. I didn’t point him to my calculator. 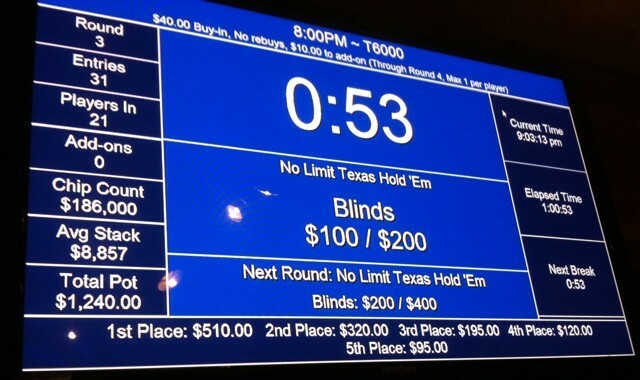 In a nine-handed game, a pair of nines is the best hand 17% of the time. K6s is good 13%. My “relative par” rating—comparing each hand’s win/tie percentage to that of a pair of aces—for K6s is 19.19%; it’s 26.87% for nines (for nine-handed play). Before I knew that the player I’d knocked out was related to my neighbor, I tried to explain why I’d called: that she’d made the same move several times from the blinds, that I had her stack covered substantially, etc. but he actually flipped his hand at me and said something like “Stop talking. Phffft, phfft, phfft.” I had a hard time suppressing outright laughter at the performance. My own feeling is that I had at least a 33% chance of taking out a player without losing more than a quarter of my stack. 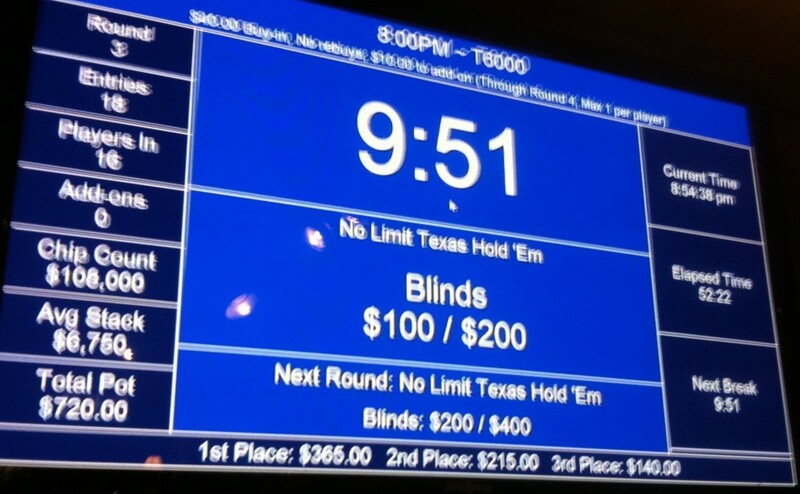 Not good odds in a cash game, but tournaments aren’t cash games. I think people forget that sometimes. Every player knocked out gets you closer to the money in a tournament. UPDATE: Essentially, this is the same situation described in this Card Player hand matchup between Pius Heinz and Phil Collins at the WSOP Main Event final table earlier this month, right down to the pocket nines, with the difference being that the player with the draw—Collins—was the one at risk. Maybe Mr. PhfftPhfft would like to take his point up with Collins. I don’t remember exactly where the tipping point in the game came. Unlike some other games, I never seemed to be significantly stacked higher than anyone else; but somehow as the night progressed people kept leaving and we eventually ended up at the final table with more or less even distribution of chips. Play was exceedingly friendly, although one of the players to my right said almost nothing throughout the night. Then, once we got to the final table, something kicked in. I think I play my best short-handed (naturally it helps if I’ve started to pick up chips). Action got down to me and the quiet guy, with us trading blinds back and forth without flops for quite a while until he was all-in with two high over cards (KxQx if I remember correctly) against my 2x2x. A pair of sixes hit the board but I wasn’t counterfeited and there was no chop. I thought there might be trouble when quiet guy dropped a $20 on the table and asked where he got paid. He took the payout and headed for the door, leaving the volunteer dealers grumbling. I spread the love, gave something to the security guard for walking me to my car, and headed home to figure out how to try to capitalize on the win. And the one time I forget to take a picture of the tournament screen…here’s one from earlier in the night that Encore posted on their Facebook page. Eight-and-a-half hours. +568% ROI (including entry, door, add-on, tips). 1st of 75 players. Probably a longer write-up in the next couple of days, but early this morning I took first place in Encore’s $10K Guarantee tournament, a belated first step in my “plan” to be playing at EPT Prague on my 50th birthday in just over two weeks. $4,275, my biggest win ever by far. To get to Prague, I needed a number of wins of that size (more or less in the ballpark of the maximum you can win on a regular basis in Portland) or I needed to get to a tournament series where I could enter several large events in the hope of hitting one. The wins didn’t come regularly (or large) enough to make the first option work, and with less than two weeks–including Thanksgiving–between now and the big day, there are a limited number of events with large enough prize pools that I could enter. So most of the winnings are going into a buy-in at The Venetian Deep Stack Extravaganza’s $2,500 final event, which meant buying an early ticket to Vegas after I cleared the plan with B, and hoping the flight’s not delayed too long. At the airport right now. Only 15 winning days before EPT Prague.